Since moving into this house three years ago we have been slowly fixing this old girl up. Can you believe this is where we started? Majority of the funds have gone to the not so fun stuff like a new roof and removing trees that were dropping limbs so big they were denting the cars. Before moving in we did simplify the kitchen by removing all the upper cabinetry that made the space feel cave like. We moved from a much smaller rental house so all the extra cabinet space was not needed. 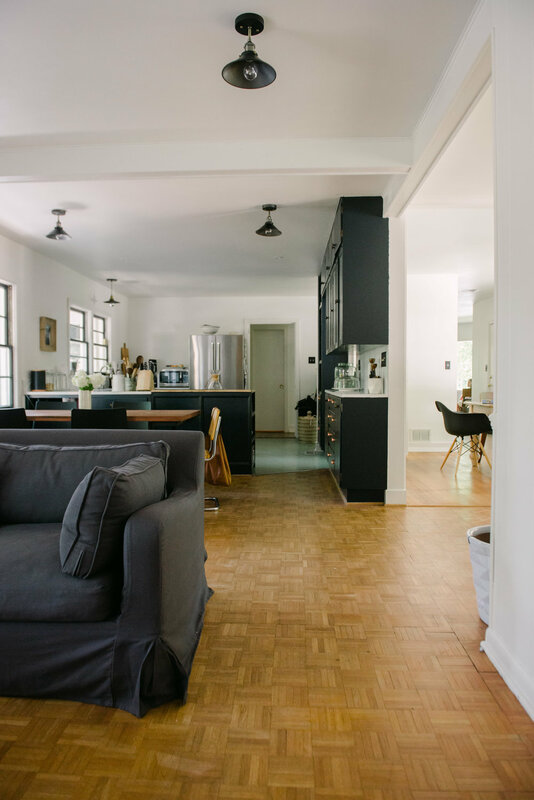 Once getting settled into our home I took to painting all the cabinets a color match of Farrow & Ball Railings, bought new appliances, and added new vinyl gray tile flooring and called it day. We did it all on a tight budget as we knew one day we wanted to do the kitchen over as this one is not in the best of shape. Well, it looks like that time is nearing as the plumbing in here is slowly dying and most of the cabinetry needs to come out anyway to fix properly. After living here for three years and going over every design possibility, I finally settled on what that will serve our family best. A pared down kitchen that looks like it may have been here from day one. Years back we were gifted cabinets pulled out from a local kitchen that was being gutted. They are similar to the bottom right image, beaded inset with the cabinet doors being a simple shaker with beading. Currently they are chocolate brown, but will be painted Farrow & Ball Railings, but this time with the real stuff not just the color match as the depth of Farrow & Ball paint can’t be replicated. We are a few cabinets short and I really desire a trash pull out so we are having those custom made. The floors are getting hardwoods to match the rest of the house, not the parquet, and we will be refinishing them all. We are keeping the peninsula as our current layout works well for the way we host, but all the appliances will be reconfigured. The stove is going under the windows so when we cook during get togethers we can still be part of the conversation. The sink and dishwasher are moving to the wall where the fridge is. This will keep the mess away from the hosting area. The fridge and a coffee bar area will be going in the nook where our washer and dryer used to be which is where you see the baskets in the last kitchen image. The peninsula will now be one solid piece and a perfect area for prep and serving. Now for the finishes, we will be drawing the kitchen in a few inches to accommodate seating at the peninsula. We tend to host large groups for small groups and are always in need of more seating. These inexpensive counter stools will be topped with leather pads. We will be doing a similar panelling treatment, you can see above right, for the back panel and sides. Carrara marble will top the main kitchen area. On the sink wall I have glazed brick pavers from Fixtures & Finishes that will go up approximately 24” inches and will be topped with a simple floating wood shelf or possibly one painted out to match the cabinets. We are indulging in a Newport Brass faucet in polished nickel, also from Fixtures & Finishes. Will be using mostly drawers in this space, but there is one cabinet that will house pots and pans, but plan to have it outfitted with drawers for simplicity. The current hutch we are wanting to keep as I love the unique reeded vintage glass and want to stay true to the home. It will be getting a fresh coat of paint, the backing will have the same panelling as the kitchen and oversized brackets will be added to make it feel more like a furniture piece. Now the Induction Bertazzoni range is on the wish list, but may have to be put off for now, but man it would look good. We do love our kitchenaid range, but can’t stand the way food bakes onto the top. An induction range is known to do this less as the burners don’t actually get hot. I feel like that would be huge a win. I am beyond excited to actually be at the point where plans can actually be made. My antsy self just wants to tear it all out immediately, but I know our continued patience will pay off. I am guilty. As much I don't want to be I am. When we moved to this house two years ago I told the kiddos that they could decorate their own rooms. Well according to Ellie I didn't actually let her do that. I was confused at first. I honestly thought I was one of those mom's that let their kiddos creativity flourish in that department. After all that's what my parents did and in the end it landed me in the design business. Alas I think in all reality she picked a couple of things then I "pulled" it all together with the rest. I thought that was giving her free rein. For her it was another room her mama decorated. Another space that didn't feel like her. Her ikea dresser finally broke after moving it too many times so that started the hunt for a new dresser. This one she fell head over heels for and no matter the 100's of others she looked at none lived up the "one", so we bit the bullet. It's neutral enough that it should carry her through high school and beyond. That in turn led to her oh so sweetly asking if she could revamp her whole room for her 13 birthday. I agreed and I quickly learned she would be my hardest client ever. I recommended finding one thing she loved and that would make it easier to build off of and in turn she will get a cohesive look and it help guide her. We found a mongolian pillow locally that she went goggly eyed over, but it was over $200 so I searched online till we came across this one that was similar and although still expensive it was WAY less than the other. It was the piece she built her whole room off of. I wasn't completely hands off throughout the process, but she knew she was in the drivers seat and would ask my opinion on certain elements. I gave ideas and presented things, like the art, that she could whittle down to final choices and she had the liberty of saying no without me trying to barter why it would be oh so good. The only element I did pick was the rug. It was a vintage overdyed teal rug and I had a feeling she would love it and I told her we could sell it if it didn't fit her vision. Once it came in and she saw it paired with the bedding she did love it. We are still waiting on the dresser to come in which we bought during a big sale and we saved money by having it sent to the store where we will pick it up instead of having to pay shipping. The headboard we are DIY'ing and I am sure she will want to add a few more touches. I hope to share the full space by the end of month, but we shall see. Way back when I started blogging my desire was to share ways of decorating on a budget. We all know every budget is different and every amount means different things to different people, but my goal was to always share things that didn't lack quality for the amount spent. I enjoyed a good DIY and needed to be creative on how to get the best bang for the buck. As our budget grew over the last decade I still hold some of the same principles in mind when decorating. I believe living within one's means is so important hence our snails pace reno. So here is to a new series that goes back to my roots. Today we are talking rugs as I believe they can make a space feel lived in, grounded and welcoming. Rugs are not only beautiful, but are functional. In an open floor plan they can help define an area, they can act as a cozy place for kids to play, and they can add character to an other wise simple space. My favorite rugs are antiques. They come already perfectly worn and can add said character in a second. Now the downside for quality rugs is that they can be expensive, especially the large ones. One way I achieve the look I desire throughout our home is to save on the big rugs and add smaller antique ones throughout. The antiques add the quality, age, and beauty I am looking for. Now for the larger rugs, we normally have to stray away from new wool rugs as our allergies can't take it although I know they are popular. They are harder to clean when the dog gets sick and they can be really expensive. Thankfully, over the years machine made rugs have gone up in quality considerably and normally is what we can afford in a large scale. They are mostly easy to clean and can take a beating. The balance between using antique rugs and newer less expensive ones is how I achieve the look I am going for on a budget. Our living room needed a large rug to cover the previous homeowners faded rug marks on the hardwoods. Refinishing the hardwoods simply is not in the budget currently. I knew I wanted something organic in feel with a lot of variance in color as I knew that would be easier to hide any marks and staining. We have a constant flow of adults, kids and pets coming into our home. Although hard to tell, this one has a lot of highs and lows in color. It's more oatmeal in color, but in our very bright space it reads more ivory which was my overall goal. It has a low pile which helps to keep it from matting, but still plush enough to be soft. We have had this rug for well over a year maybe even two and it has held up really well. This one is actually an indoor/outdoor rug from the Emily & Merritt line at Pottery Barn. Unfortunately they no longer carry it online, but some are still in store. Indoor/outdoor rugs have really upped the game. They no longer feel like plastic and can be quite soft under foot. They are normally flat weaves so a quality rug pad is a must to keep it from slipping. The best part is that they are animal and kid proof which is always a win in my book. This one may be my favorite. I came across it at an estate sale. The home was filled with mid century modern furniture, photography, and art from all around the world. I believe we would have been friends in another time. I was grateful to carry home a piece with me. The use of antique or vintage rugs in the kitchen is simply my favorite. They can take quite a beating as most have survived for decades already. They clean up well and add personality. This one I like to think distracts from the vinyl flooring and laminate countertops that we hope to change one day. I still miss the rug that we lost when our old, old house flooded. It sat a few too many days in water to be saved. The petite one here fits perfectly by our washer and dryer which is in a open nook off the kitchen. You can also see that we have the top to our washer ready, but have yet to add the sides. One day I am certain it will happen, but for now I try to be content that this little space functions well. Before starting the hunt for any rug I get all my ducks in a row. I first get my measurements needed for the space. I know what "look" I am trying to achieve and color ways. Most importantly I set a budget for myself, because I know good and well that I can over spend quickly and justify the price for the so called "perfect" rug. For larger cheaper rugs I tend to search places like overstock which is where our living room one came from. They make it easy by being able to filter by size, color, and material. You can even filter by price which can help keep one honest on how much you really want to spend. Plus many people upload their own images so you can truly get a sense of the rug in a real space. Sometimes you can find a beautiful one at your local Home Goods, but I find it easier to scour the web. Places like West Elm, Pottery Barn, CB2 and Serena and Lily can be a good source especially when they have their big blowout sales. All the stores also provide an additional discount if you sign up for their emails. They usually all have a good assortment of indoor/outdoor rugs too that may fit the bill even more as they can be a bit more budget friendly. Once fall arrives most of the latter will be marked down considerably. The biggest savings can normally be found in store though with overstock sales or floor displays. Have a little bit more money to spend? The selection at McGee and Co I have used before for interior design projects and have always been quite happy. She does host holiday sales too and her selection is easy to navigate. For vintage and antique rugs, my go-to's are from a few different sources and I always have to be mentally prepared for the hunt as it can take some time. They can be a bit more pricey hence my go-to are smaller rugs. Of course local estate sales can be such a good source, but you have to know your area to hit it right. Etsy is one of favorites. I tend to lean towards shops that have had at least 30 buyers, but I prefer more in most cases. Ratings and reviews also need to be really positive. I find this to be the best route since a lot of the selection can come from out of country. Saying that, I also look for shops that state they clean the rugs before shipping and I also try to be aware of shipping costs as they can vary greatly. A few more of my favorite shops for antique and vintage rugs I found via Instagram over the last few years. Loom and Kiln, Rug and Weave, The Southern Loom, Lily and Loom Rugs and my newest find that also happens to be local is Lillie Kat Rugs. I have noticed that all these shops will have Instagram sales randomly that discount a rug steeply and holiday sales can be found. Finally e-sale rugs is another go-to. My kitchen kilim rug came from here and I bought it for a steal. Wait for a sale. It's worth it when working on a budget. Layering a smaller rug over a larger sisal rug would be another way to get the most for your money. Things I keep in mind when shopping for older rugs... There may be wear and tear, but that is part of the charm. I try to stay away from holes though. The sizes may be odd so typing in a common size may not yield all the best results. Finally I tend to think of the rugs as pieces of art worth the investment. Who knows, maybe they will in my kiddos home one day. ~ Did you know Overstock has a whole section dedicated to one of kind rugs? This one reminds me of my master bedroom rug. Would be a bit short for a king, but would be perfect for a queen or full size bed. This one in a kitchen or wide hallway would be stunning. ~ This shop has had 710 sales and 275 reviews with a 5 star rating so I would feel confident to buy. The whole shop is full of great finds, but I love this one with it's blue tones. This one is pretty much a dead ringer for my kitchen rug and the price is fabulous even with the added shipping charge. ~ I have so many rugs bookmarked from this shop. Plus she offers free shipping and is here in the states. The size and price of this rich blue kilim is remarkable. I am already dreaming up a whole boys room that could carry well into college years around it. Every kilim is a beauty though. ~ This rug I seriously contemplated buying, but alas I don't have a spot for it. The faded worn quality that comes with age makes me swoon. A large master bath, kitchen, hall, bedroom, really the possibilities are endless. ~ looking for a neutral rug? This one is a beauty. Again it can really live in any space. Truly a piece of art for your floor. Would even be a candidate for layering over a larger sisal.